For the more than 6,000 students sitting in a sea of Carolina blue in Kenan Stadium on May 13, the journey to graduation was anything but easy. There were demanding classes, all-nighters and countless assignments to overcome on the way, but those challenges led to a degree from UNC. Marine veteran and social entrepreneur Rye Barcott ’01 urged them in this year’s spring Commencement address to continue taking their challenges and turning them into something useful and positive. Rye Barcott ’01 delivers the keynote address to the Class of 2018. “The truth is, many of life’s most fulfilling moments — and most accomplishments — rarely happen without some degree of pain,” said Barcott, who is co-founder of two organizations: Carolina for Kibera, which aims to develop local leaders and alleviate poverty in East Africa’s largest slum; and, more recently, With Honor, a civic organization that is helping elect to Congress a cross-partisan coalition of post-9/11 veterans. Chancellor Carol L. Folt presided over the ceremony that drew nearly 30,000 of the graduates’ family and friends as well as UNC System Board of Governors’ Chair W. Louis Bissette Jr. ’68 (JD); Board of Trustees’ Vice Chair Charles G. Duckett ’82; and the outgoing chair of the GAA’s Board of Directors, Jim Delany ’70. 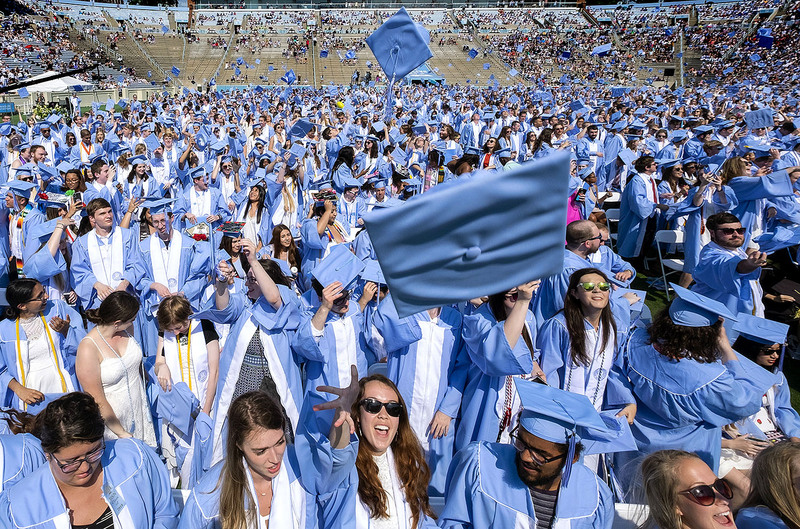 The degrees of 6,119 Carolina students were conferred during the 90-minute ceremony. They included 3,886 with bachelor’s degrees, 1,596 with master’s, 262 with doctoral and 637 with professional degrees from the schools of dentistry, law, medicine, nursing and pharmacy. “Your future is brighter because of your degrees, and I know that you’re not going to forget how much you’ve been given,” Folt said. “Carolina seems to bring out the call to serve and a feeling of immense gratitude in all of us. Folt reminded the graduates that while their time as Carolina students has come to an end, the University will always be a part of them. • James F. Goodmon, CEO and chair of the board of Capitol Broadcasting Co. Drawing on his experiences since graduating from Carolina in 2001, Barcott encouraged the graduates to persevere through difficult and challenging times by maintaining a positive attitude, serving others and keeping perspective.